Spring cleaning as a season may be officially over, but you and I know ALL. TOO. WELL. it’s never really over. Before you reach for those yellow latex rubber gloves and a hazmat suit, what if we told you there’s a better, smarter and safer way to get a sparkling clean shine and rid your home of unwanted pests – without resorting to toxic chemicals? Introducing your new BFF. She’s a protective relative, so to speak, she’s transparent and she has your back, your floors, and even your countertops. 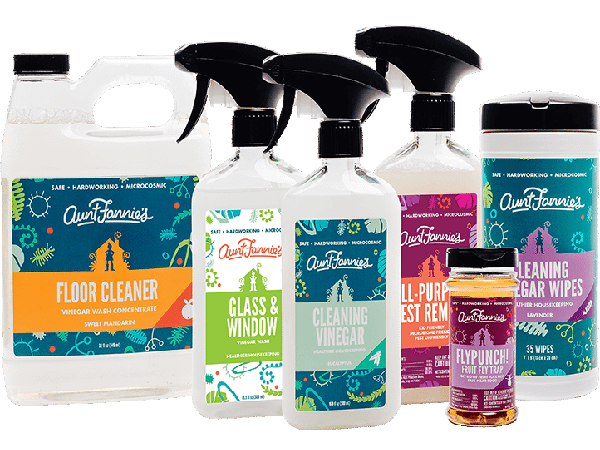 Aunt Fannie’s is leading the next natural movement with food-grade, non-toxic, cleaning and pest control solutions made with pure whole, food-based ingredients that are evolutionarily-adapted and safe for human and skin contact, pets and keeping your home, body, and the environment healthier. Made with 95% + whole, food-based ingredients, our products come as nature intended and are evolutionarily adapted to our bodies (think ancient grains or fermented foods). This provides a healthier and safer atmosphere, unlike plant-based/derived ingredients (used in other leading brands), whole ingredients aren’t broken in a lab with manufacturers adding and subtracting whatever they like. What Products Does Aunt Fannie’s Offer? In the early days of the Aunt Fannie’s founder and his son’s numerous health struggles, Matt’s family opted for what they thought was the best solution: plant-derived cleaning products. But as their son continued to struggle with autoimmune diseases, eczema and asthma, they realized change was needed, not just in diet, but in cleaning products. They realized that even plant-based products are manipulated in labs. 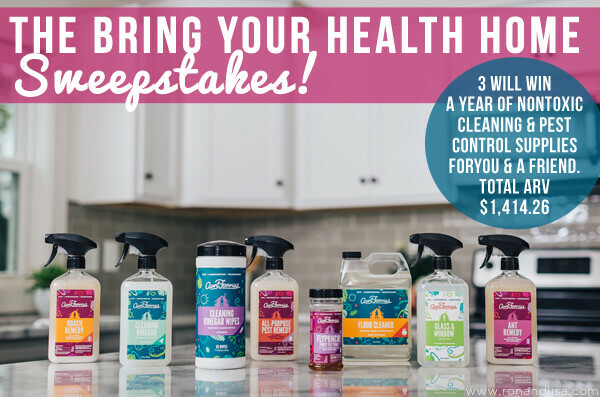 Hence, Matt and his family began using whole, food-based ingredients to create cleaning solutions with the obvious notion that when we clean, we ultimately ingest, inhale and absorb these ingredients into our skin. Once this shift was made to replace synthesized plant ingredients with food-based ingredients, the last healthy puzzle piece to fall into place. Shop now to find Aunt Fannies store locations near you including a line of household and pest control solutions for a healthy family and a happy home. While there will only be three GRAND PRIZE winners, our friends at Aunt Fannie’s are offering a super special and oh-so generous discount for RonandLisa readers to SAVE 20% off your total purchase. Just use code MICROBIOMIC HERE and get ready to scrub, sparkle and sigh a healthy breath of relief! • Mosquito Wipes are DEET free and worry free! i entered and received message that the giveway ended almost 3 weeks ago!!!! Hmm, not sure what the confusion is Deanna. All of our campaigns run for 30 days and we announce the start in our weekly newsletters. In addition, all of the start/end dates are listed directly on the entry page and in the rules.